Waccabuc is believed to derive its name from the Wackabuck (which means “all water drained away”) River, it’s mouth is “Long Pond,” now known as Lake Waccabuc. This lake is the largest of the seven lakes in the town of Lewisboro. In the 1850s a hotel was built there and the area was promoted as a vacation destination. The area was mainly farmland owned by the Mead Family, which has left its mark on the area with Waccabuc’s main thoroughfare, Mead Street. The main family vacation house is now home to the Waccabuc Country Club and the Mead Memorial Chapel was added to the National Register of Historic Places in 1999. 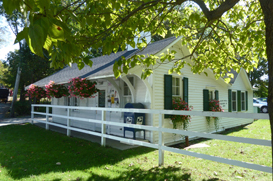 Many of the roads here are unpaved and the small post office is the social center of the community. The Waccabuc Landowners Council is dedicated to preserving open space in this 1.96 square mile hamlet.